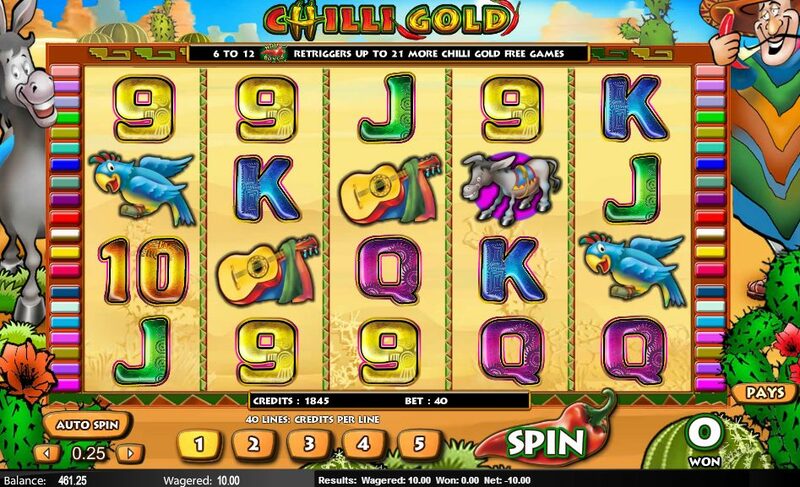 I’m a sucker for a few chillies in my food of a Saturday night, so it’s always nice to play a slot set in the heat of Mexico, like online slot developer Amaya’s bright 'n’ breezy Chilli Gold game. In fact, if you’re familiar with Leander’s Mexican-themed Mad Pinatas and the comic madness of Pariplay’s Las Cucas Locas, you should enjoy this. A 5-reel, 40-payline game, Chilli Gold is full of the colors of Tijuana or Cancun, and the action is as hot as the chillies on the reels. There are Stacked Wilds, and betting in the game starts at a mere $0.01, but a maximum bet of $200 means there’s enough to keep the bigger bettors interested. On the reels, as well as the key chilli icon, we get a jolly Mexican in a sombrero, his trusty guitar, a squawking parrot, some maracas, and a donkey, plus the requisite 10-through-Ace card symbols. The Red Hot Chilli is the Wild and Scatter! The red hot chilli is both the game’s Wild and Scatter, and appears on reels 2, 3, and 4 only. However, the symbol is stacked, so you can bag plenty on the reels if you’re lucky enough. Having said that, despite them being stacked, I found I had to play through plenty of spins before hitting any chillies in any significant number. 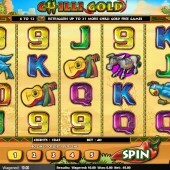 Free spins can be yours by hitting six or more chilli Scatters/Wilds on the reels. The more chillis you hit, the more spins you receive, anything from 3 to 21 spins. During free spins you’ll also be hit up with lots of juicy stacked gold chilli Wilds on reels 2 to 5, which substitute for all symbols other than the regular red hot ones. With some colorful, simple graphics, neat animation on winning combos, and easy interface – I liked the ‘win’ counter on the bottom of the game screen – Chilli Gold is certainly a slot for players who like their slots uncomplicated. Add to that an innovative bonus trigger and there’s little to dislike here. As long as you can play through enough spins to get to the bonus round, it’s a winner. If you can't get enough of the Mexican chilli theme then check out Aristocrat's ode to the chilli in the form of More Chilli, an excellent slot in my opinion.